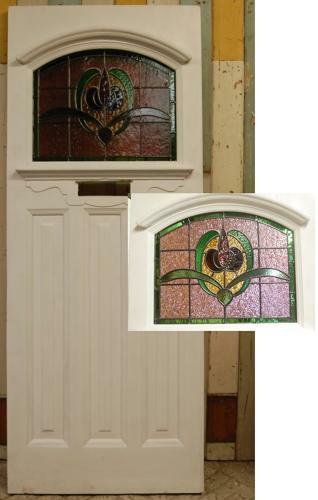 A fantastic pine Edwardian front door with original, restored, stained glass panel. The door has a classic Edwardian design with shelf and eyebrow and a decorative apron around the letterbox opening. The lower half of the door has three vertical panels. The door is in very good condition and the front of the door has been primed and undercoated, ready for topcoat to be applied by purchaser. The inside face of the door is stripped and can be left plain or we can prime and undercoat for an EXTRA £72. Please let us know at time of purchase if you require this service. The stained glass has a beautiful design, with bright purples and greens. The larger panels have a textured effect. The glass has been restored and is of a fine quality. Please note purchaser will have to add safety glass to the inside of the stained glass panel to comply with regulations. We can offer this service, please contact us for a quote. The door is solid and in very good condition but does have some slight signs of wear due to age. There are some light marks and stains to both sides. One lock is still present and will need replacing. There are some small knocks and chips to the edges. The inside face of the door has some patch repairs. Door hardwear will need to be supplied by purchaser. A fantastic quality and very attractive door, illustrating Edwardian design. A very desirable item that would add great style to a home.